How would you like to personally be part of ensuring that the 1906 Shay locomotive “Ole Four Spot” produces steam again? Steve Bullock, Governor for the State of Montana, has awarded a $26,704 Department of Tourism grant to the Heritage Museum for restoration of the locomotive’s fire box. The grant contract required that the Heritage Museum match the grant money with $13,353 in cash; for total overall project cost of $40,057. This firebox work is critical for the boiler to produce steam again. Your donation marked specifically for the “Shay” will help ensure the success of the restoration project! Donations and/or membership forms can be found online at www.libbyheritagemuseum.com. Completed forms can be dropped off at the Libby Chamber of Commerce, 905 W 9th Street; or mailed to: The Heritage Museum, P.O. Box 628, Libby, MT 59923. 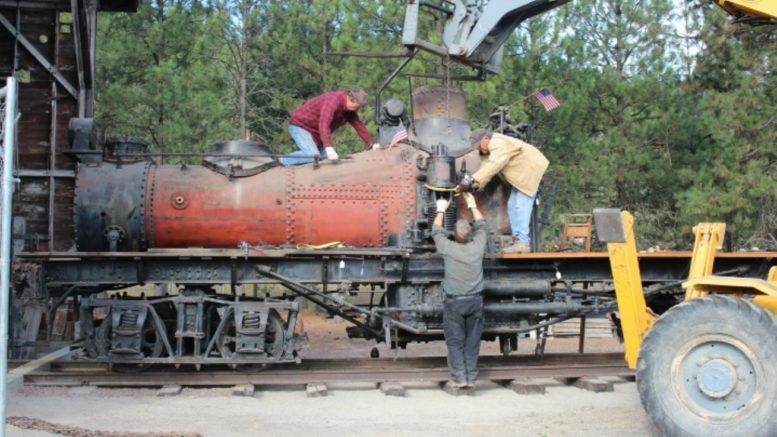 Volunteers at the Museum have completed disassembly of the locomotive for rebuilding/restoration. Professional locomotive engineer consultations and over 100 ultrasonic test results have been positive that the locomotive is repairable, can be restored to operating condition, and will meet Federal boiler safety requirements. The Museum wishes to thank the many local contractors and businesses who have aided the Shay restoration project, such as Granite Concrete who used their heavy equipment to remove the boiler from the locomotive at no charge to the Museum. Volunteers and contractors are now ready to begin reassembly of the restored locomotive from the wheels up. Luke Johnson, owner of Toutle Valley Locomotive Works, LLC in Washington State, documents, welds, and proves locomotives to Federal Railroad Association standards. Luke has personally inspected the Shay in Libby and stated that he “was very pleased with the work that Museum volunteers have completed to date.” During 2019, Luke is expected to spend several months in Libby completing the firebox restoration work as outlined in the grant contract, with assistance from local volunteers. The grant application process required that the project include niche product development of interest to nonresident visitors, as identified in “Montana Destination Brand Research.” A 2016 visitor survey conducted as part of that research, found that “history buffs” (over one-third of the overall respondents) are clearly a high-value audience that fits Montana perfectly. The visitor survey also found that respondents rated “Historic attractions” as an “Extremely important” attribute in selecting travel destinations and represent a large and lucrative “niche” segment. We believe that both railroad and history buffs from around the world will want to see the restored Shay because it is believed to be the last remaining workable locomotive of its class in Montana. The preservation and restoration of the Shay adds a key artifact of local logging culture and strengthens a destination asset for the Libby community for rail, cultural, and heritage tourism. The Shay will serve to enhance the tourism/visitor economy of south Lincoln County by attracting visitors who have interests in railroads and/or historical events. Mark your calendar! The Heritage Museum will open this spring on Monday May 13 and remain open 7 days a week through September 14; the “Opening Day Celebration” will be held on Saturday June 1 from 10 a.m. to 4 p.m.